All Albirex Niigata need to do to retain the Great Eastern-Hyundai S-League title tonight is avoid defeat when they play Warriors FC at the Jalan Besar Stadium. The White Swans' coach Kazuaki Yoshinaga, however, is not presuming that the title is in the bag, regardless of the equation. "It makes no difference and, as usual, we will fight for the three points," said the 49-year-old. "We will prepare for a solid win." The form book points firmly to three points for the league leaders. Albirex are unbeaten in their last nine S-League matches, winning eight and drawing one. 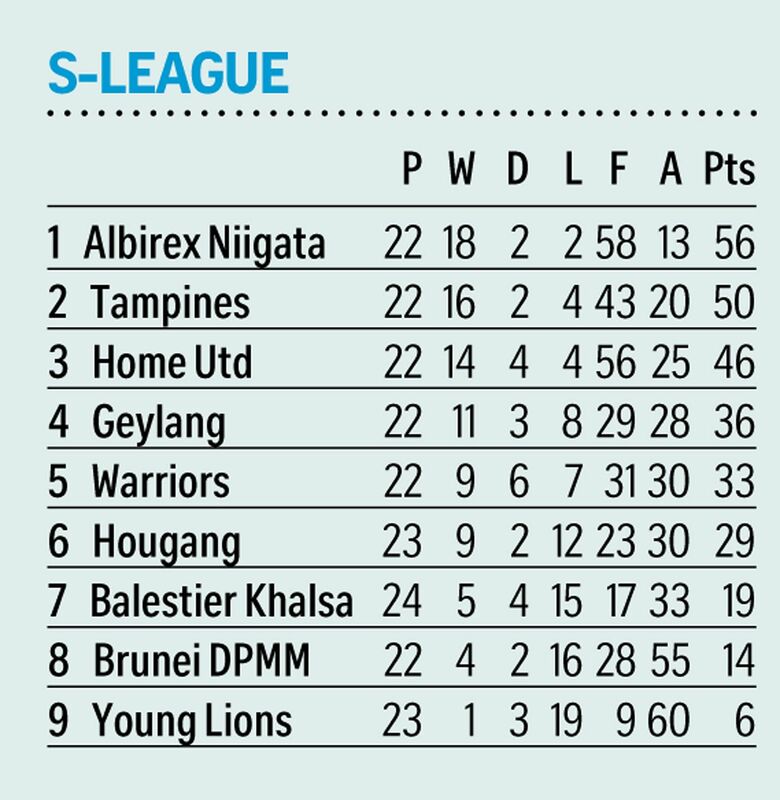 Points Albirex Niigata have dropped in their last nine S-League matches. Fifth-placed Warriors, meanwhile, have spluttered in the second half of the season. They have won just two of their last nine games, losing four times and drawing the other three matches. But Yoshinaga is wary of the threat they pose. The last time the two sides squared off at the Jalan Besar Stadium was during The New Paper League Cup final in July, when the Warriors arguably outplayed Albirex. But they were undone by an inability to finish off their chances and a goalkeeping error in extra time, which handed the trophy to the White Swans. Eight days later, the same script played out when the two sides met in an S-League clash at the Choa Chu Kang Stadium. The Warriors carved out chance after chance, but could put the ball in the net only once, while two deflected goals - the winner arriving deep in stoppage time - helped Albirex to a 2-1 win. While he admits he is surprised by the Warriors' patchy form, Yoshinaga expects a tough test tonight. "Although their results are unexpected, their players' high level of ability has not changed," said the former Shimizu S-Pulse coach. "The Warriors are a team with high-quality players in many positions, so we have to pay attention to all of them. "We will prepare to fight together as a team to overcome them." Warriors skipper Shahril Ishak admitted he and his team-mates have been inconsistent this season, but added that they are fired up to prove a point against Albirex. "This season, we have performed well in big games against teams like Albirex, (second-placed) Tampines Rovers," said the 33-year-old, who is the joint local top scorer in the S-League on 10 goals, along with Home United's Faris Ramli. "In fact, (third-placed) Home United did not manage to beat us in four meetings but, at the same time, we have lost to the likes of (bottom-two teams) Young Lions and Brunei DPMM. "Now, against Albirex, we are out for revenge. In the last two games between us, we did not take our chances, simple as that. "If we can repeat the same level of performance and put the ball in the back of the net this time, I know we can get the result we want."